Welcome to part 7 of 12 in my Tutorial Tuesday series! Every Tuesday for 12 weeks, I’m dishing out video tutorials for my top requested questions on Design, Layouts or Tricks with WordPress and Divi. In this tutorial, I show you “How To Vertically Center Content in Divi.” Divi has an option to “Equalize Column Heights,” but it doesn’t center the content in the modules which can be very frustrating. You can certainly do that by adding padding and margins to the Divi module your content is in BUT, if content gets rearranged, you’ll have to rework everything you did to make it look right again. Luckily, this tutorial shows you the quick and easy solution! This tutorial is based off of this post by Michelle Nunan of Divi Soup which has helped me out tremendously. We’re going to take what she created but dive into it a little further and explain WHY and HOW it works. 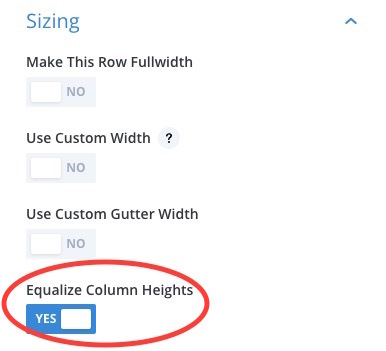 Equalize column heights in your row. Josh, I can’t tell you how many times I have tried to position images so they are aligned in the center of a column and match the text in an adjacent column. I have never used the following expression before (probably because I am a baby-boomer) but your tutorials “rock”! Haha thanks, Eddie! I’m right there with ya man. This method has been a HUGE time saver for me. Thanks for your continued support and feedback! Thanks, Josh! This is great. Not just the vertical centering, but also on how to make & resize the round image. This worked perfectly. Great, simply (elegant, eh?) solution. haha awesome, Sal. Someone in our Divi group pointed out an even easier solution. Drop this CSS in your stylesheet, then all you have to do is select Equalize Column Height then it works automatically. Hi Joshn, this is not working for me. Is the above code correct? Hey Lucas, yeah it’s correct and is what I use now! Just be sure to have equalize columns selected on the row then it should work. I cant get the updated method to work. Any tips to make that work? Also I cant get the old method to work either. Its weird the two colum method you did works just fine IN THE VISUAL BUILDER. But when I save it and go to the page, it doesnt work. Plus if I have a 3 column with text in each colum and that text is uneven in each, I cant get the buttons to align under the text. Hey Alex, try that updated method out now! For some reason, when I put the CSS in it replaced the > symbol. Should be good to go now! Hey Sal, thanks for the heads up. Yeah for some reason when I pasted the CSS in it messed that symbol up. Good to go now. is it possible to do a vertical-align:bottom as well? mmm I’m sure it’s possible Ralf but I haven’t done something like that. I imagine you’d just find some css to make it stick to the bottom. Could try W3 Schools for some CSS for that. Hey Pierre, I mention you, well nameless currently 🙂 from the update on 11/16/17. I don’t like to link back to FB threads so let me know if the tip is ever on your site then I’ll be sure to link to that! And even if I haven’t create a tutorial for that tip as you do, a link to my website will be appreciate ;). Great to hear it’s resolved. Cheers! Hey there. This worked great for me, except the alignment for some reason isn’t applied to the tablet or mobile version. Any ideas? mmmm not sure, Lauren – works for me across all devices so I’d just be sure to clear cache and make sure nothing is overriding that code. How can I make this work for a single text module inside a column with other modules that are not to be centered? I tried adding it to the text module but that doesn’t seem to work. mmm not sure on that, Lizzy. I would think it’d work but you could try some different centering CSS methods or just manually adjusting the padding. Thanks for the tutorial and a code but I have one question. if I set padding 150px (for example) for the Text in the Column1 Main Element – all looks well in big screens. 150 px are around the text. But if to start to resize the screen you will see that on the left side of the text – there is 150 px do not change. And on mobile, it looks ugly. I have to change the margin in minus values to move it left to the center of the screen. Maybe 50 px of padding will be OKay but 150 px is not! May require some CSS/media queries on this one if you want thing to align different on mobile. Hope that helps for now! I want to put the image in the bottom. How should I do Josh? There is a setting in the image module to keep image at the bottom! Been looking for solution for this for a long time!